Don't miss out on the many recreational opportunities, including an outdoor pool, an indoor pool, and a sauna. This hotel also features concierge services, gift shops/newsstands, and a hair salon. When you stay at Guest House Fontana in Mlini, you'll be near the beach, within a 5-minute drive of Mlini Beach and Srebreno Beach. This guesthouse is 9.2 mi (14.8 km) from Lapad Beach and 9.3 mi (14.9 km) from Banje Beach. This charming hotel enjoys an idyllic setting, nestled amidst the Croatian Riviera in Mlini. The hotel is located just 7 km from the medieval city of Dubrovnik and 8 km from the airport. Guests will find themselves just a 5 minutes' walking distance from a number of shopping opportunities, dining options and entertainment venues. This delightful villa welcomes guests with warm hospitality and excellent service. The guest rooms are beautifully appointed, featuring vivid tones and a refreshing ambience. The rooms offer a peaceful setting in which to relax and unwind at the end of the day. Guests can enjoy a host of excellent facilities and services at this hotel. Shuttle bus is subject to local charges. Offering modern, sparkling accommodation and a superb range of facilities, this striking beachfront establishment boasts a prim location just a short walk along the quiet promenade from neighbouring Mlini. Guests can choose between taking a dip in the attractive outdoor pool area or strolling down to the small pebbly beach with plenty of sunbeds and space to unwind and relax in this tranquil haven of Croatian delight. After a day in the sun, tourists can visit the state-of-the-art SPA centre, which offers numerous pampering treatments to soothe the mind and body. The dining options including an on-side restaurant with a terrace, which provides fantastic sea views for the backdrop of the perfect evening. Featured amenities include a 24-hour front desk, luggage storage, and an elevator (lift). A roundtrip airport shuttle is provided for a surcharge (available on request). Grab a bite at Oleander, one of the apartment's 4 restaurants, or stay in and take advantage of the room service (during limited hours). Relax with your favorite drink at the beach bar or the poolside bar. Buffet breakfasts are available daily from 7 AM to 10 AM for a fee. Located in green overviewing green fields but also near nice hotels, resorts, shops, post office, restaurants, walking trails, beaches etc. Comfortable, good postition, possibillity to visit many places from there. Our large apartment offers three bedrooms (double bed/twin beds), fully equipped kitchen, living room. Apartment is air-conditioned, with large terrace with table and chairs. Parking is available in front of the house. Nearest beach is Srebreno beach. You can also find grocery shop, bars and restaurants in few minutes walk from the apartment. This is ideal location for visiting Dubrovnik and again not to be in the middle of the crowded city. Our neighborhood are quite and peaceful, perfect for rest from busy and noisy places. Just for the rest your soul and body in green and peaceful surrounding. Featured amenities include a 24-hour front desk and laundry facilities. A roundtrip airport shuttle is provided for a surcharge (available on request), and free self parking is available onsite. Make yourself at home in one of the 6 air-conditioned rooms featuring refrigerators and flat-screen televisions. Complimentary wireless Internet access keeps you connected, and satellite programming is available for your entertainment. Private bathrooms with showers feature complimentary toiletries and hair dryers. Conveniences include microwaves and coffee/tea makers. Make yourself at home in one of the 7 air-conditioned rooms featuring refrigerators. Complimentary wireless Internet access is available to keep you connected. Bathrooms with showers are provided. Conveniences include safes and desks, and housekeeping is provided daily. 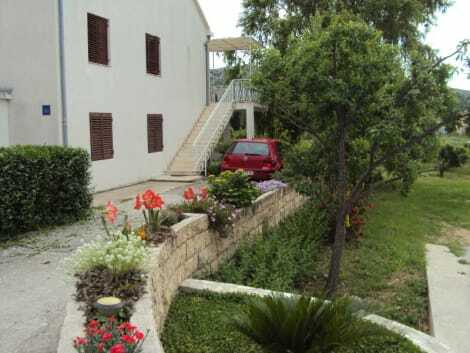 These charming holiday apartments enjoy a peaceful and quiet setting overlooking the deep, blue Adriatic Sea, only eight kilometres from Cavtat and ten kilometres from Dubrovnik. Guests can spend lazy afternoons lounging on the scenic beach backed by lush Mediterranean vegetation, only a short walk away, or take a day trip to the UNESCO World Heritage old town of Dubrovnik to walk along the impressive city walls and picturesque harbour. The apartments are simply and elegantly decorated with modern furnishings, overlooking the sea or the enchanting garden terrace. For a fun-filled holiday of sea and sun with the whole family, these cosy apartments offer added space, flexibility and independence. Bed linen and towels are provided free of charge. The property offers self-catering apartments in a recently built family house. Placed in one of the most peaceful areas of Dubrovnik- peninsula Lapad-Babin Kuk. Within a walking distance, there is a great selection of tourist and service ammenities. The property assures your safety, peace and privacy. Each apartment is modernly and carefully designed. Each fully equiped to a highest standard in order provide all needed comfort during your stay. Bed linen and towels are provided free of charge. There is a free parking space - reservation needed. lastminute.com has a fantastic range of hotels in Mlini, with everything from cheap hotels to luxurious five star accommodation available. We like to live up to our last minute name so remember you can book any one of our excellent Mlini hotels up until midnight and stay the same night.